Use Banner Ups PowerTabs® adhesive grommet tabs to turn your digital image into a super-strong outdoor banner – instantly! Crystal Clear PowerTabs® adhesive grommet tabs let your color image shine through. Super strong for outdoor use. Use PowerTabs® adhesive grommet tabs with virtually any banner media, Tyvek®, Coroplast®, Foamcore® , scrim vinyl, or paper. 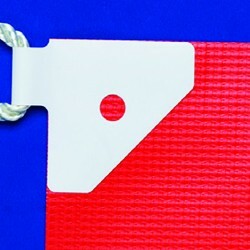 Banner Ups Adhesive Grommet Tabs were designed to make banner finishing easy, fast, and super-strong. In the past, banner finishing has required special equipment such as a sewing machine or welding machine to create a hem, and a grommet machine to install grommets. All that banner finishing equipment can cost thousands of dollars. The banner maker’s only other alternative was to send out for banner finishing which can add tens of dollars to the cost of each banner and add one or more days to the production, time that the banner customer usually can’t afford. 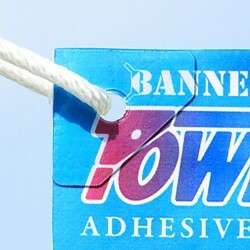 With Banner Ups adhesive grommet tabs, banner finishing is easy. Simply print your banner, then peel and press to apply Banner Ups, PowerTabs, or EdgeTabs to your banner corners and you are ready to go. For light duty or indoor use, place a rope through the convenient neck loop. For outdoor strength punch a hole through the tab center hole and place rope through the hole. This can as much as triple the strength of your banner finishing when compared to grommets alone. The perfect tool for this is our Banner Ups PowerPunch, a heavy duty hole punch that is specifically designed to punch a clean, properly placed hole through the tab and banner media. The Banner Ups family of products includes a variety of solutions to meet your precise banner finishing needs. 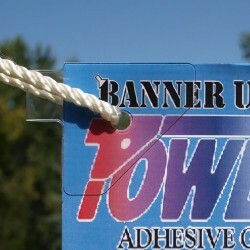 Use Large Banner Ups Tabs for your outdoor needs, and mini Banner Ups for indoor banners. For banners, up to 6 feet (two meters) in length, four tabs at the corners will usually suffice. For outdoor banners always be sure to place rope through the tab center hole for greatest strength. For banner finishing on banners of more than 6 feet in length, place tabs on the corners and then apply Banner Ups PowerTape over the tabs along the top and bottom edge of the banner. PowerTape is a single-sided tape which is made of a super strong film. Therefore no folding or sewing of a hem is needed to complete your banner finishing. There is another factor to consider if you are looking for a better banner finishing solution and that is the environment. Reduce, Reuse, and Recycle are the ways to reduce the high cost and devastating environmental impact of landfill waste. One of the problems with metal grommets is that they make perfectly recyclable plastic films, such as polyethylene and polypropylene, non-recyclable! What a waste! All white Banner Ups products are made of a base of polyethylene film, which means that when you use Banner Ups with any polyethylene plastic film, the entire end product becomes recyclable. No need to remove grommets before recycling. Contact us today to see how Banner Ups Adhesive Grommet Tabs can solve your banner finishing challenges. What is the difference between Banner Ups and PowerTabs®? Why should I use one or the other? PowerTabs® are used for virtually the same application as Banner Ups. They simply include several product innovations. For instance, PowerTabs® are made of a super strong engineered multi-ply film. This film is just as strong as the thicker plastic from which Banner Ups are made, but because it is thinner it blends more invisibly into the banner surface. Also, the shape of the PowerTabs® is different, making them more natural looking on a banner corner. Both tabs can be mounted horizontally or vertically on the banner, but the Banner Up can also be mounted at a 45-degree angle. Finally, PowerTabs® are mounted on a release sheet making them much easier and faster to peel and stick than regular Banner Ups, a factor which becomes more important on larger volume jobs. Banner Ups and PowerTabs® are designed specifically to withstand outdoor conditions. The polymer films and adhesive systems are engineered for use in the widest possible range of temperatures and environmental conditions. If you want a banner that will last for a year of continuous use or many years of seasonal use, we would recommend that you buy a heavy duty banner material, reinforced with webbing and grommets. However, if you are creating an economical banner that will be used for between a few weeks and a few months, you can use Banner Ups and PowerTabs® with confidence. We have had customers tell us they had our products on banners that lasted over a year and were still going strong! It is very important to install the PowerTabs® first, followed by the PowerTape®. Why? Because the tape has a silicone release coating on it to make self-wound rolls possible. As a result, if you put the PowerTape® down first the tabs will not stick to it! Try it and see. If you discover a situation where you really want to adhere the tabs over the tape, you may dissolve the silicone release coating from the surface of the PowerTape® by gently rubbing the tape film surface with a rag soaked in nail polish remover (don’t overdo it – it could melt the plastic film too!). This will quickly remove the silicone release coat and adhesive will stick to it. When should I use the neck loop to fasten the rope and when should I use the center hole in the PowerTabs®? The two questions above need to be considered together because the answers relate to the amount of strength required for your application. There are several degrees of strength that can be achieved with the Banner Ups, and PowerTabs®/PowerTape® system. We recommend that for indoor or light duty outdoor use you may use either Mini Banner Ups or Mini PowerTabs®. 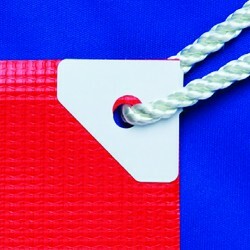 In either case simply apply a mini tab directly to each corner of your banner and then use the tab’s center hole to fasten the rope. Similarly, for indoor or light duty outdoor you may use the Large Banner Ups or PowerTabs® with the rope attached to the corner loop. For the next degree of strength, use the large tabs with the rope through the center hole. 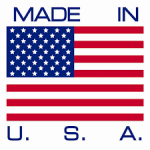 This can be used for most outdoor situations with banners eight feet and under in length. For the maximum strength, use both PowerTabs® and PowerTape® as described above. This is recommended for banners in excess of 8 feet in length or where maximum wind exposure is expected. Naturally, no banner can be guaranteed to withstand all possible environmental conditions, but consider this strength data. The strength of a rope when tied through the center hole of a mini-tab or through the loop of a large tab will hold up to about 50 lbs of force. A rope tied through the center hole of a large Banner Ups or PowerTabs® will hold up to about triple that force -150 lbs. With the addition of PowerTape® that number goes to over 200 lbs of force. That means when you use the PowerTabs®/ PowerTape® system on all four corners you can create super-strong banners that can withstand up to 800 lbs of wind load!